This gardenia will transform your garden path, making your walks all the more delightful with its beautiful look and gorgeous scent. It's easy to maintain, too, as it'll naturally form into a tidy 2-3' mound with bright white blooms. The double blooms are intensely fragrant and easily attract beneficial pollinators to your garden. The color also really pops in low evening light. 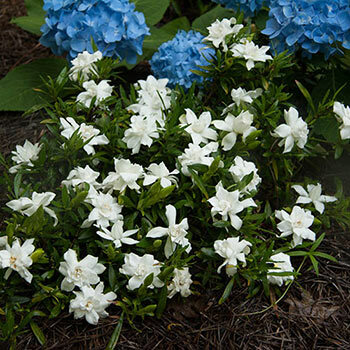 Gardenias are known as strictly southern dwellers if you want them to perennialize, but this one is cold hardy up through zone 7! In warm climates you can use it as an evergreen groundcover.